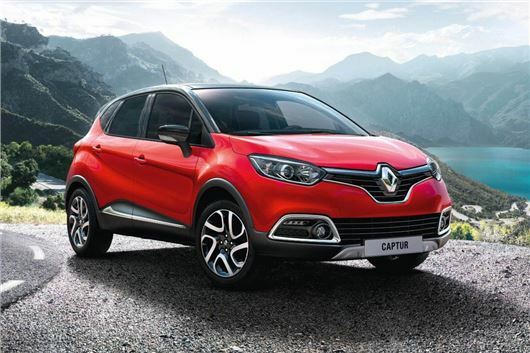 Renault has signed off a range-topping version of the Captur crossover SUV. Called the Captur Signature, it usurps the Captur Dynamique S MediaNav’s position at the pinnacle of the range, and includes additional stuff like part-leather chairs and a rear parking camera. From the outside it’s distinguished by a set of 17-inch ‘Explore’ alloys with black inserts, as well as a two-tone paintjob and chrome detailing for the sides, grille and fog light surrounds. The metallic paintwork you see on the picture above is exclusive to the Signature specification, and called Flame Red. Other colours are available. The colour theme continues on the inside, with scarlet plastic surrounding the infotainment unit, speakers and air vents. The full R-Link media system sits within the new red frame as standard, an upgrade from the bog standard media system – and if you want to know how we’re getting on with R-Link at the moment, click here. The R-Link shebang includes a seven-inch touchscreen, TomTom-based satnav including live traffic updates, USB media player connectivity and an upgraded Arkamys sound system. As per the rest of the Captur range, other equipment includes electric folding door mirrors, climate control, tinted rear windows, Bluetooth connectivity and LED daytime running lights. If you’d like to order a new Renault Captur Signature, you can sign up now at any Renault dealership. Prices start at £17,495, which will get you a 0.9-litre TCe turbo petrol version with 90PS, while £18,895 will put a 90PS 1.5-litre dCi diesel under the bonnet, returning 78.5mpg. And if you’re averse to a clutch pedal, two automatic versions are available: a 120PS TCe petrol and the aforementioned diesel, costing £19,695 and £19,895 respectively. Chkout www.BillionairesBrain.com, this is such a timesaver. . The ultimate tool for the self-educated entrepreneur.